Mushrooms going slimy - it is an issue. Has this ever happened to you? You have mushrooms you've recently bought. They are in your fridge in the same packaging you bought them in. They are by no means old. But you go to use them and they have turned slimy! This has happened to me too many times to count. And I hate wasting food, so when I saw this tip from an instagram friend I knew I had to try it. 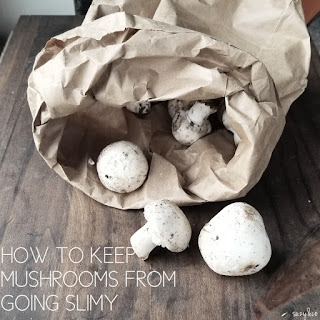 Take fresh mushrooms, unwashed, and place them in a paper bag in the fridge. Seems too simple, right? The plastic just does not let them breathe and so they would start going bad quicker. They last so much longer now. The only slight negative would be that they can get a bit dried out, but not bad at all. Much better using slightly dried mushrooms, then having to throw away slimy ones. I got this tip from a wonderful Instagram friend 50dollars7days. 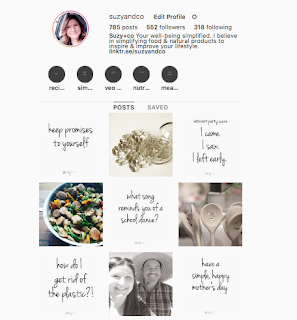 She spends $50 a week for her family of 3 and shares it on Instagram. She is a great account to follow.